CARACAS – Five months after violent clashes among inmates forced the closure of Venezuela’s largest jail, authorities revealed that they had discovered decomposing remains in the facility. The number of bodies has doubled from seven last Friday to 14. The prison is currently being refurbished as part of a government programme to bring the country’s penitentiaries up to international standards, according to Iris Varela, the minister for penitentiary affairs. 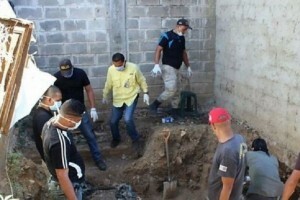 “We received reports… that bones were found, human remains, and we immediately activated an investigation at the prison at San Juan de Los Morros,” Varela told a news conference last Friday. The penitentiary was closed on October 28 to end weeks of violence between warring factions of prisoners vying for control of the facility. Complaints had also surfaced that inmates had died because of inadequate food and medicine. According to the non-governmental group A Window on Freedom, the General Penitentiary of Venezuela, as the prison is officially known, had an estimated 9,000 inmates prior to its closure. The group estimates that some 88,000 people are incarcerated in Venezuela, 33,000 of them in police jails.